A rain-swollen spillway got the best of a greens keeper Tuesday afternoon at a North Texas golf course. Hernando Botero, a greens keeper at Diamond Oaks Country Club, was attempting to cross a Big Fossil Creek spillway on the golf course when his truck got caught in the fast-moving current. Botero said he has driven across the low-water crossing countless times, but the water level was higher than normal because of morning storms. The bed of his fertilizer-filled truck was swept over the edge of the dam, leaving him stuck inside surrounded by roaring water. Swift water rescue teams from Haltom City, Grapevine, North Richland Hills and Hurst all responded and pulled Botero to safety. 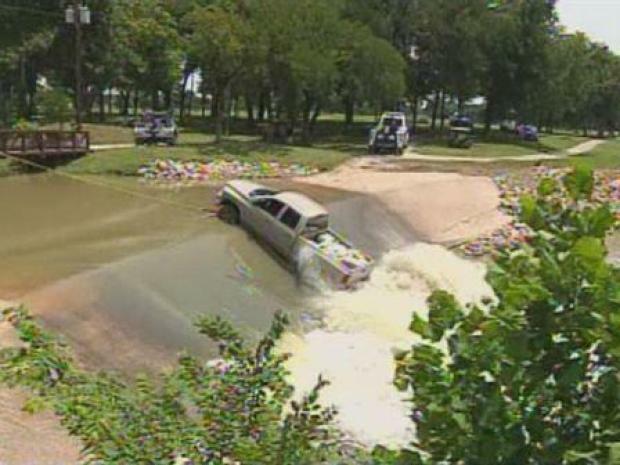 A greenskeeper at Diamond Oaks Country Club was attempting to cross a spillway on the golf course when his truck got stuck in a fast-moving current. Botero said he feared for his life because he's not a good swimmer and that he thought about his two children while he waited to be rescued. Botero said he's learned his lesson. Botero's employer at Crop Production Services said he was scared for Botero and glad he's alive. Tow truck operators were able to get Botero's truck out of the water and back onto dry land.